In honor of Women’s History month, I thought I’d introduce you to Sara Bisel, considered by many to be a pioneer in the field of forensic anthropology, the application of the anatomical science of anthropology in a legal setting. In simpler terms, this means that a forensic anthropologist can “read a skeleton” by using physical markers on the bones to determine a victim’s age, gender, and height in addition to potential causes of death due to injury, medical procedure, or disease. The stages of growth and development in bones and teeth indicate whether the victim was an adult or child. The shape of the pelvic bones indicate male or female, and abnormal changes in the shape, size or density of bones can indicate trauma or illness. 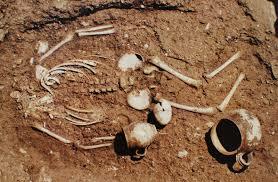 Trained anthropologists can also examine remains for clues about ancestry. Various techniques are used to study skeletons including X-ray, photography, CT scans, and high-powered microscope. DNA testing as well as other chemical testing is performed. All data is then compiled and studied in order to draw informed conclusions. Dr. Bisel was the first to uncover and identify skeletons found in the ancient Roman city of Herculaneum, buried under molten lava in AD79 after the eruption of Mt. Vesuvius (the same eruption that buried Pompeii). Through her examination of the bones of fifty-five victims from the incident-the largest group of ancient Roman skeletons subjected to modern scientific study, she devised a set of forensic tools now used as the foundation for the chemical analyses performed on skeletons. Born in 1932, Sara Bisel was raised in western Pennsylvania and graduated from Carnegie-Mellon University with a degree in Nutrition. 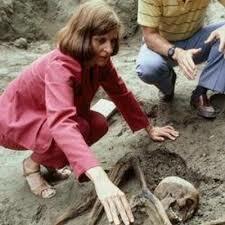 She then went on to earn her Master’s and Doctorate degrees in classical area studies with specialization in Greek archaeology and physical anthropology. Awarded a fellowship from the Smithsonian Institute in 1977, she was later sponsored by the Institute and the National Geographic Society. Widely traveled she conducted research in Greece, Turkey, Israel, and Italy. 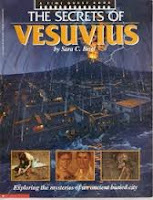 Author of numerous articles in scholarly and professional journals, she also wrote an award-winning children’s book, The Secrets of Vesuvius which was published in several languages. Ill for several years, Dr. Bisel passed away in 1996 at the age of 53, a life cut short.